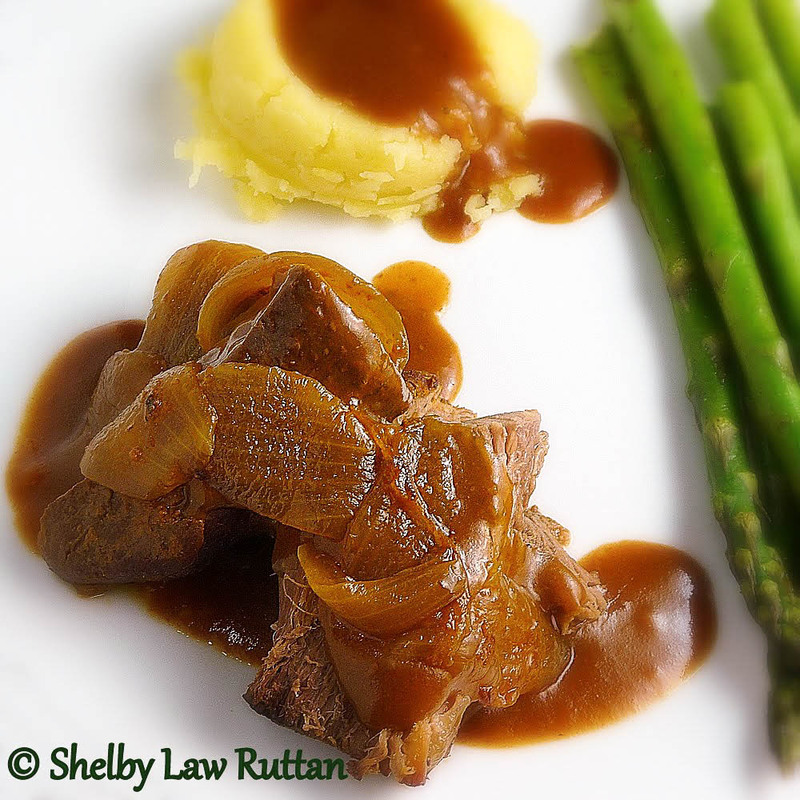 Warm and comforting, this Pot Roast and Onions recipe will satisfy your senses in every way, right up to a full tummy! Starting with the wonderful aroma you will have in your home and ending with the chock full of flavor, gravy covered, and fork tender beef on your plate! Weekends and weather that bring a chill to the bone bring about dinners like this one was. While it wasn’t freezing cold by any normal February standards in New York, it was still chilly and the wind cut right through you. When it’s cold outside I think a lot of us love to have a crockpot meal going slowly all day long, filling the house with delicious aromas and making us look forward to dinner time while we laze around the house under comforters with books (or Kindle). Pot Roast and Onions, mashed potatoes, and roasted asparagus with a glass of Twisted Sister Wine. The perfect windy, cold weather match. Try it, you’ll like it! Trim fat from beef if needed. Place roast in large crock pot fat side up. Top with onion wedges. In measuring cup mix together tomato sauce, water, horseradish, mustard, salt and pepper. Pour over top of roast and onions. Cover crock pot and turn heat to low for 8-10 hours. Remove roast from crock pot and strain broth. Remove as much fat as possible from top of broth. In a small bowl, whisk 2 tablespoons flour and 3 tablespoons water until smooth. Place broth in a medium saucepan and bring to a boil. Whisk flour/water mixture into boiling broth whisking constantly until thickened. Serve roast with gravy and onions. 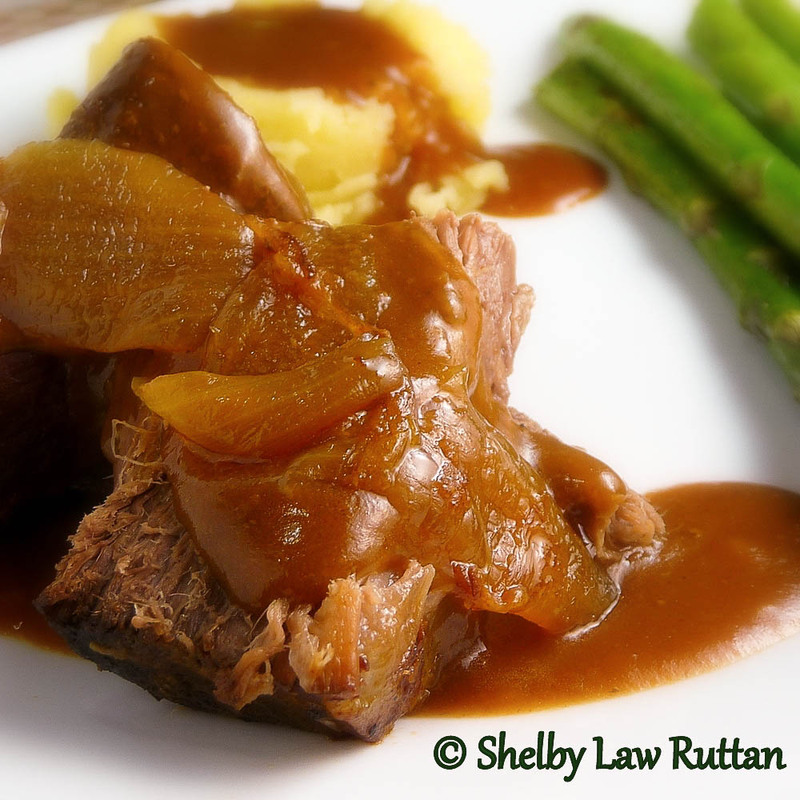 Pot Roast and Onions – Pin it! This looks delish. I could eat pot roast constantly. It's just so yummy!